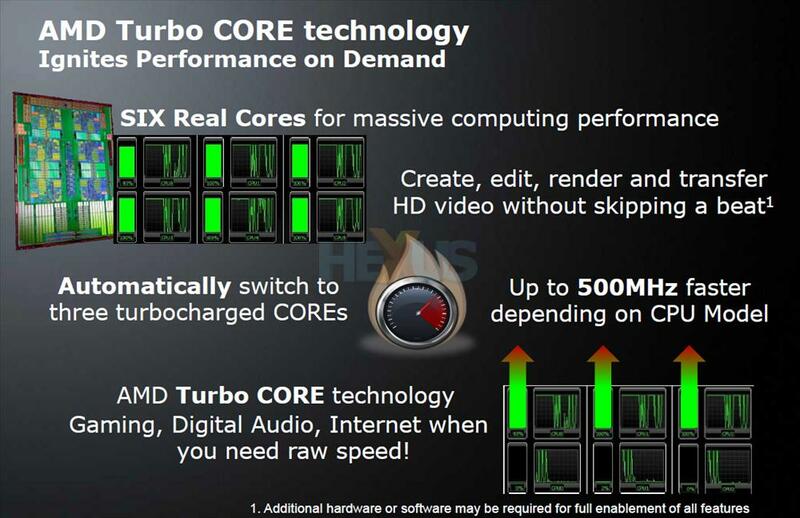 The fact that AMD will be introducing Intel-like Turbo Boost technology to its upcoming hexa-core processors isn't exactly a secret, but the chip giant has today finally divulged some of the finer details. AMD's on-the-fly performance boosting technology, dubbed Turbo CORE, will make its debut in upcoming hexa-core Phenom II X6 CPUs and aims to beef up the value proposition of AMD's range-topping parts. On paper, it seems identical to Intel Turbo Boost - promising to automatically increase the frequency of certain CPU cores to improve performance when other cores aren't needed. 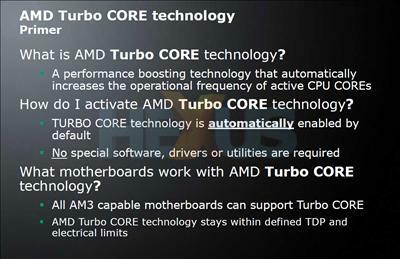 Sounds a good idea, but AMD's Turbo CORE implementation isn't quite as elegant as Intel's Nehalem. AMD's current architecture doesn't feature an equivalent to Intel's power gate technology, and the company's chips are consequently unable to shut down cores as and when required. 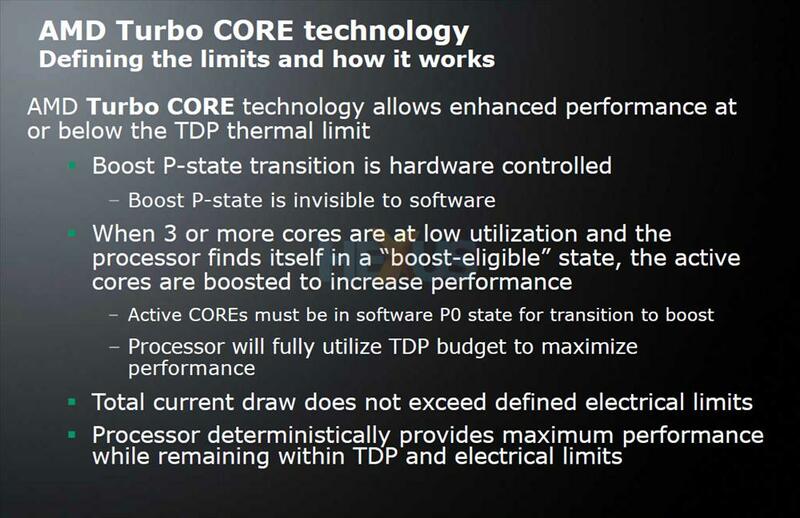 In order to remain within TDP constraints, AMD Turbo CORE will instead dynamically down-clock idle cores to allow room for the remaining cores to be sped up. Putting numbers to what seems like a simple process, a six-core Phenom II X6 part with at least three idle cores is deemed to be "boost-eligible", and the chip will reduce the speed of those cores to 800MHz, allowing for a frequency boost of up to 500MHz on the remaining three cores. 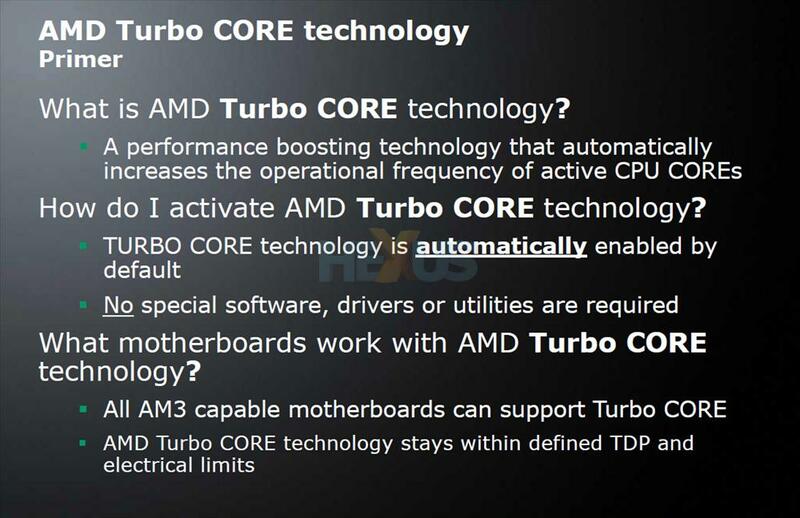 Looking at AMD's upcoming parts, Turbo CORE technology will provide triple-core speeds of up to 3.6GHz on the 3.2GHz-rated 125W Phenom II X6 1090T, whilst the entry-level 2.6GHz, 95W Phenom II X6 1035T will boost three of its six cores up to 3.1GHz. 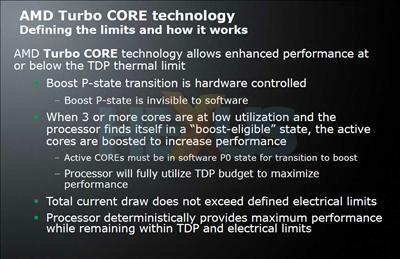 Turbo CORE will then filter through to quad-core parts starting with a new Phenom II X4 960T, codenamed Zosma. AMD hasn't gone into detail, but we'd presume the quad-core part will permit boosted speeds on two of the four available cores. Knowing that Intel's one-and-only hexa-core part - the wicked-fast Core i7 980X - fetches around £900, AMD is continuing to bolster the credentials of its competition. It remains a distant second in terms of all-out performance, but with six cores, a variation of Turbo Boost and backward compatibility with existing AM3 boards following a firmware update, a well-priced Phenom II X6 could go down a treat. Can Hexus clarify a point? The middle slide seems to indicate the boost applies to 3 cores, ie it's a simple 3 down and 3 up arrangement. 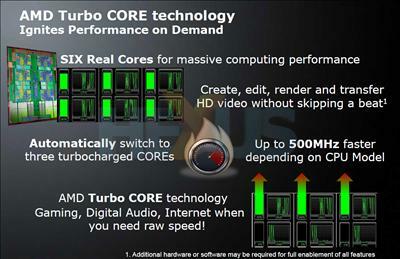 The final slide seems to indicate it can boost less than this (3 or more cores idle, remaining full load cores boosted), leading to 4 down 2 up, or 5 down and 1 up scenarios. Honest answer, we don't know and we can't check until we get our hands on the processors. The statement seems to indicate that 3 down 3 up, 4 down 2 up, and 5 down 1 up scenarios will all be possible.